Jonathan Koomey, Project Scientist with the Lawrence Berkeley National Laboratory and Professor with the Stanford University, during his speech at Green:Net 09 (via Earth2Tech). French entrepreneur Jean-Michel Planche recently launched internetforeveryone.fr, a new initiative aimed at promoting an open, neutral and free Internet for everyone (french-speaking volunteers : feel free to join here). Of course, this initiative is the french equivalent of the well-known and pro-active internetforeveryone.org which focus on the US. Beside all the sociological and ethical aspects, which are fundamentaly the most important ones, hence our priority number one, there's all the technological stuff to be adressed. From the very roots of the Internet (i.e. the IP protocol, Ethernet, etc.) to the less high-level kind of matters such as fiber networks installation and maintenance, we must to re-invent the whole thing. With for some, like network construction, a pretty deep impact on Social : building Fiber-To-Every-Home networks will require tens of thousands of workers - meaning will create tens of thousands of jobs (100,000 in France alone for the next 5 years, shall the telcos push the ignition button). Just like the construction of railroads in the 19th Century gave jobs to thousands of emigrants and locals in North America ***. That's what makes Jean-Michel' s initiative so exciting - and challenging. For once, we can be part of a World-Changing project. Now, why now ? Why is it mandatory to * re-invent * the Internet, as opposed to enhance/upgrade/patch the existing infrastructures, protocols, topologies, etc. ? Have a look on Bob Metcalfe' s keynote speech at OFC'08 earlier this year (see notes here). The bug is in the Domain Name System, or DNS, which is the system for translating the locations of network computers into Internet addresses. The flaw is in the design of the DNS protocol itself and is thus not limited to any single product that uses it. If someone hijacks a DNS server, they can redirect an unsuspecting Internet surfer to a malicious web site. A hacker targeting an Internet Service Provider, or ISP, could replace the entire Web (as accessible through that ISP) — search engines, social networks, banks — with their own malicious content. DNS is used by every computer on the Internet to know where to find other computers. Those attacking corporations could reroute network traffic and capture emails and other sensitive business data. Don't you think it's time to think again ? *** you may call me an utopist or a fool. Then, ask yourself the question : what is the REAL reason for all those FTTH nets' construction delays ? Answer is simple : lack of (skilled) resources.
" High-technology services across large tracts of Asia, the Middle East and North Africa were crippled Thursday following a widespread Internet failure which brought many businesses to a standstill and left others struggling to cope. Industry experts are blaming damage to two undersea cables but it is not known what caused the damage. Reports say that Egypt, Saudi Arabia, Qatar, the United Arab Emirates, Kuwait, Bahrain Pakistan and India, are all experiencing severe problems. Nations that have been spared the chaos include Israel -- whose traffic uses a different route -- and Lebanon and Iraq. Many Middle East governments have backup satellite systems in case of cable failure." As stated by one of the interviewed ISPs, this pretty severe outage is a wake up call for the region. 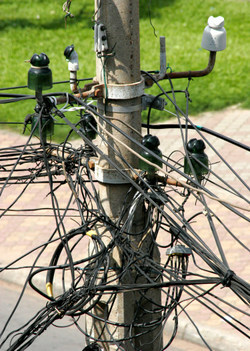 But also for the whole Telecoms industry : it's time to stop lay offs and start lay out new cables. Dear submarine systems makers, you've got a bright future ahead of you ! Just like in the mid-90's, when the big projects such as FLAG and SeaMeWe appeared. The difference ? Today, there are people at the end of the fiber. Applications. Business. Users. It's showtime for the real Net Economy, folks ! Thanks Laura for the heads up. Back in 2000, I titled the brief report of the OFC Optical Fiber Communications exhibition to my management at Agilent Technologies : "The Magic is gone." The whole Telecoms industry was ruled by marketeers, and Fiber was no different. The Lucents, the Cornings, the Pirellis : they were all selling wonderful shiny proprietary solutions to hungry customers (the new telcos which were popping up like hell everywhere on the Planet), totally forgetting that what made the Optical Communications industry in the past was Innovation. Fact is, until 1998 the fibers were sporting strange names, such as "ITU-T G652". Everything changed in '98, when Corning came out with its Leaf, Lucent with its TrueWave, or Nec with its Lucyna. Since then, marketeers took over the business, leaving inventors and researchers in their labs. The best example : the Pirelli Telecoms booth at OFC'99, with an... italian motorcycle as the only product on stage. For people like myself, whith a technical background, a marketing position and a customer-focused mindset, the outcome was obvious : a total lack of real customers' s needs, leading to what happened to be a violent downturn. Today, almost 8 years later, my feeling is that the Magic is back. Reaserchers and innovators can talk to end-users again. See this product presentation video by... Corning : for the very first time since a decade, a new product is a true solution to a real customer problem. Thanks to The Broadband Hub, this highly interesting presentation by Dr. Robert Atkinson of The Information Technology & Innovation Foundation (ITIF). Although it's 100% USA-focused, I'm sure most of the ratios apply to the rest of the Western World too (incl. France of course and unfortunately). Ever wanted to help building the Future ? Watch this cool video from the online job board GadBall.com, and drop me an email afterwards ! Did you know that by 2010, 20 typical households will generate as much traffic as the entire internet moved in 1995 ? This fact, and much more, on this video. More on Internet Innovation later this week. Thanks to the weekly delivery of my YouTube' subscriptions, just discovered this video from the Electric Power Board, a.k.a. EPB, of the city of Chattanooga, Tennessee. “A recent study by a group of professors at the University of Tennessee at Chattanooga and Tennessee State University suggests these economic and social benefits alone could top $600 million for Chattanooga over ten years. Another study, verified by the Electric Power Research Institute, indicates that Fiber to the Home will also allow EPB to make significant improvements to its electric power distribution system. The infrastructure can help the company locate problems earlier, restore outages more quickly and gain efficiencies that are not currently available. It will also allow EPB to provide more tools to help customers reduce their power usage and cost. See the video - and much much more - directly on EPB' s website here. Read why the such an initiative always generates FUD here and here. More on the lovely city of Chattanooga here. Among many other key factors to make a city a nice place to live in, this : "The city supports a downtown shuttle fleet of zero-emission electric buses - manufactured here in Chattanooga - for commuters and visitors wishing to park-and-ride." Post-Scriptum : for those of you who are too young to remember, here's why the title, and a pretty cool video to illustrate it. Is The Fiber Magic Back ? At the recent ECOC European Conference and Exhibition on Optical Communication which closed its doors yesterday in Berlin, Germany, Alcatel-Lucent researchers delivered post-deadline papers that remind me the good old days of the pre-Bubble era (i.e. when Marketing was not the ruler). A few facts for novices : a data rate of 1 Terabit per second represents roughly 12 millions telephone landlines; ten years ago, the transmission record was set around 3 Tbit/s, equivalent to approximately 40 millions lines; in late 2000, the record was at 6.5 Tbit/s, allowing the transmission of 1 million motion pictures over a single fiber at a time. As stated by french pioneer and researcher Emmanuel Desurvire in his paper "Optical Communications in 2025", presented at ECOC'05 : " 20-years objectives can only be reached though tech-driven research and there is an urgent need to get started." It seems AlcatelLucent got started again, leaving marketing behind the labs' s doors for the sake of the whole Fiber Optics industry. The Fiber Optics Industry keeps accelerating its pace towards full recovery and bright sustainable future. The forthcoming "GPON Deployment Forum" organized by IIR Telecoms is a must-attend for all of you involved with FTTH Fiber To The Home networks. GPON Deployment Forum is to be held Mon 03 Dec - Thu 06 Dec 2007 at the Moevenpick Hotel, Amsterdam, Netherlands. 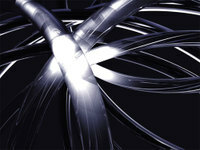 UK-based Telco 2.0 is running a market survey on the future business models in the Broadband arena. To participate, click here. My take : IP, FTTx, and Web 2.0 are going to change the whole Telecoms landscape, with Telcos and ISPs and others to make money on services rather than on infrastructure. Thanks Benoit for the heads up.
" Cisco found that American video websites currently transmit more data per month than the entire amount of traffic sent over the internet in 2000. " This, and much more, into the article written by Matt Chapman of the Australian online magazine ITNews. For the Telecoms Industry, this is the best news since the downturn : Finally, there is a real need for bandwidth. It's a given that telcos, cable TV operators, and the remaining carriers' s carriers will have to build lots of new long haul networks pretty soon, for the actual infrastructure will start showing off its limits. post-scriptum : You may also read the original article published by Ars Technica last week : " Report: Cable companies facing big bandwidth crunch ". What If Google Shuts Down ? Today, Skype is holding its breath, for the first time ever according to my early adopter's s memory. For those of us who use Skype for overseas business communications, the issue might cause only some minor troubles - hey, we still have landlines and cellphones, right ? UPDATE August 17, 2007 @ 10:51AM CET : Skype login still down. Japan Telco & R&D leader NTT was the first to come on the market with a new type of fiber aimed at Fiber-To-The-Home easy deployments. That is due to the fact that FTTH roll out started earlier in Japan than in the US. The question is : how about Europe, and France especially ? Local Telcos and ISPs seem not to be concerned by technics, and the local fiber optics industry has been almost wiped out after the crash, back in the early 2000's. So, no industry, no innovation, no innovation, no more industry. Time to do something, Mr President ! Worldwide leader Corning announced a breakthrough optical fiber technology, performing over 100 times better than standard fibers. The N.Y.-based fiber maker worked closely with Verizon to resolve FTTH installation challenges. "This is a game-changing technology for telecommunications applications," said Peter F. Volanakis, president and chief operating officer at Corning. "We have developed an optical fiber cable that is as rugged as copper cable but with all of the bandwidth benefits of fiber. By making fundamental changes in the way light travels in the fiber, we were able to create a new optical fiber that is over 100 times more bendable than standard fibers." Corning's newest fiber technology achieves this while maintaining compatibility with industry performance standards, existing manufacturing processes and installation procedures. "So, customers don't have to sacrifice one benefit to get another," he said. About broadband access : " Fibre in the Last Mile in Europe ", the recent report from Frost & Sullivan, published: 9 July, 2007. F&S claims fibre-to-the-home deployments reached over 2.5 million homes in 2006 and estimates this to reach over 14.0 million in 2012. Searching for information on the Global Information Grid, I found this awesome/mind-opening/think-out-of-the-box article : "Network Maps, Energy Diagrams : Structure and Agency in the Global System", by Brian Holmes. Holmes describes current researches aimed at mapping networks of all kinds, from the obvious Internet to illegal sea-going immigration routes to pedestrians' s everyday itineraries in Amsterdam. To document its very detailed yet comprehensive explanations of the background and applications, Holmes links to lots of websites which are worth the visit. Among all those sites, you may check this one : Each frame of this movie-map is a snapshot of Internet usage across the world during a few hours time; five different images were compiled every two days, over a period of some eighteen months. The result is an extraordinary visual experience. The ISPs turn green and advance toward the center as their connectivity increases; the link lines shift as the routing structure reconfigures to meet the moment’s demands. We watch the diurnal flux of the Internet, and feel the complex, disjunctive rhythm of the global information machine. It’s like the pulsing of a hive, a planetary brain: the cognitive and imaginary activity of untold millions of individuals, establishing far-flung connections. The Internet is the vector of a new geography – not only because it conjures up virtual realities, but because it shapes our lives in society, and shifts our perceptions along with the ground beneath our feet. Networks have become the dominant structures of cultural, economic and military power. Yet that power remains largely invisible. How can the networked society be represented? And how can it be navigated, appropriated, reshaped in its turn? Twenty years later, what has become of the mapping impulse? What new forms of cartography have arisen to chart the virtual/real spaces of the present? What kinds of agency do they permit? What modes of social organization do they foster? Can critical and dissenting maps be distinguished among the established and dominant ones? Full article and much more, here. France : The Broadband Heaven ? "French policy has nurtured competition among providers, advancing the country to the cutting-edge of broadband technology", writes BusinessWeek correspondent in Paris Jennifer Schenker in her article Vive la High-Speed Internet! What a difference a few years make. In 2001, France had one of the weakest markets for broadband Internet access in the developed world, with less than a quarter of the penetration of the U.S. Today, it has sailed past the U.S. to become one of the world's most wired nations, with more than one in five inhabitants enjoying high-speed Internet connections. What's even more interesting is what the French are doing with their fast hook-ups. According to tech research firm Analysys, a remarkable 52% of broadband connections in France today are used for voice-over-Internet protocol, or VoIP, phone calls—far and away the highest level in Europe and perhaps in the world. In Britain and Germany, by comparison, just 6% of broadband connections are used for VoIP. The French also have gotten off to a fast start in Internet TV. Analysys figures 2.6 million households in France now get TV over the Net using Internet protocol technology (IPTV). That's about 10 times the number using IPTV in Britain, qualifying France as the European leader in video-on-demand services. How did the land of wine, cheese, and luxury goods become a world-beater in cutting-edge Net services? Part of the credit goes to what could be called the Battle of the Boxes. Paris and other cities are plastered with ads for state-of-the-art home Internet gateways—with names like Livebox, Freebox, Neufbox, and Dartybox—that offer connection speeds of up to 28 megabits per second, plus voice calls, TV, and Wi-Fi. They usually come for free with a monthly broadband subscription starting around €30 ($41). This and much more in the full article here. Comparison of pricing for consumer broadband in Europe here. The battle for the soul of the broadband customer goes on behind closed doors. But it's not all behind the doors to the development labs where ingenious engineers hatch super-secret capabilities. Nor is it all behind the doors to the central office from which all bandwidth flows. One of the biggest battles is being waged by technicians behind the doors to the den and to the family room. In this new frontier, the key to winning the broadband battle — not that there ever will be a clear-cut winner, only interchangeable market leaders — may depend on the weapons, or tools, with which service providers outfit their technicians. With FTTH and FTTN implementations in full swing, significant changes are taking place in all aspects of network testing that will affect not just an upswing in the sale of test gear, but how, from where and by whom live networks and services are tested. There are still those vendors looking for ways to “outfit the Super Tech,” said Peter Schweiger, business development manager for optical network test systems at Agilent. But he and others believe that may never happen. In some respects, the technologies are too numerous and complex for technicians to have command of them all. For the same reasons, it is untenable to have a single tool a tech can carry. The whole Testing 2.0 concept is right at the core of this article : for several different reasons, today's technicians need simple red & green lights tools to test the broadband access (and TriplePlay services) at the subscriber premise. Testing 2.0 goes even further : it's all about making tools for non-technicians. 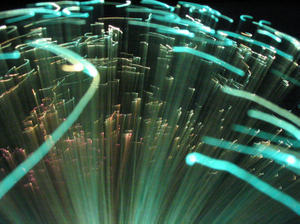 This weblog being named after the fiber optics technology, it's time to go back to the roots.
" More bandwidth is always beneficial, but it is no longer a networking panacea. If we want to add complex network-based applications, we better be ready with an appropriate network architecture." My take on that : once the FTTH Fiber To The Home networks will be largely deployed in every major city of the World, the whole Telecoms industry will move for a giant overhaul. New fibers for wireline infrastructures, ubiquitous Wifi/WiMax everywhere, and mesh archictecture as the standard.